With just two weeks until its official release, Ubisoft and developers Blue Byte have today revealed the last minute Anno 1800 open beta that will occur just a couple of days before the game’s launch. Anno 1800 is a city building real time strategy game set during the industrial revolution, and is the seventh game in the Anno series. While the previous two games visited the future, Anno 1800 returns to the olden days, however includes some new features like tourism, blue-printing, and the game will also explore the effects of the industrial revolution on some of the more primitive cultures. 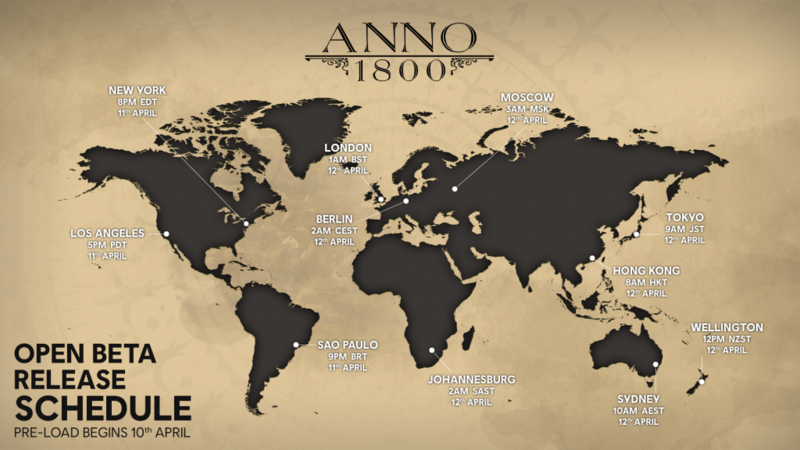 The Anno 1800 open beta will kick off at 10AM AEST on the 12th of April and running through until the 14th with pre-load opening up on the 10th of April, giving gamers the opportunity to try out the finished product and iron out any bugs ahead of its launch on the 16th. Welcome to the 19th century, a time of industrialisation, diplomacy, and discovery. For more information on the Anno 1800 open beta, head to the official Union Update (Anno 1800 blog).